Light is made up of “waves” [Christiaan Huygens] . . .
Life is the result of “ethereal fire” [Thomas Gale and associates] . . . In 1806, New York had just recovered from several yellow fever epidemics. These epidemics made their way into the continental interior by way of the port cities of New York and Philadelphia. During the late 1790s, these were the two primary locations were where yellow fever caused the greatest number of deaths and, resulted in thousands to tens of thousands of residents fleeing these port cities. 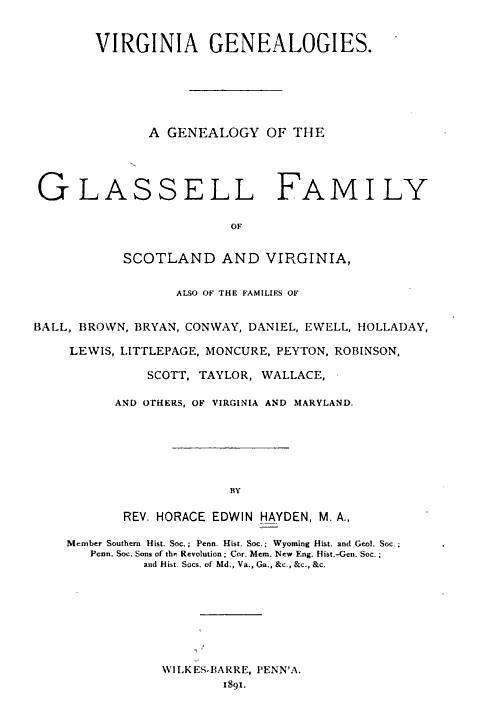 Many of these individuals escaped this great plague by residing in the larger more inland towns of the Hudson River Valley. At the northern end of this valley was Albany. To many, the town of Troy east of Albany was the urban center. But to politicians and individuals involved in local commerce and governmental duties, Albany was the center of the State’s northern and central economy. Albany captured the statewide recognition as the more important of these two locations when it came to the medical laws and societies. It was closest to the second city to bear a medical college in the state’s history, just one county over towards the northwest near Herkimer and Genessee. However, in terms of fame, arts and crafts, and even fortunes and success, the core of the upstate portion of New York’s philosophy was Troy, NY. In Poughkeepsie, there were a number of physicians vying for their own claims to fame, some very much fixed on the vital force theory, and others on the biological, physiological, and chemical mechanisms at work in the body and responsible for life. Dr. Van Kleeck of Poughkeepsie was mostly the latter form of physician, who was more than likely apprenticed by a member of the Osborn-Van Kleeck line of his heritage and who was more engaged in the makings of patent medicines, with an emphasis on many of the chemicals and toxic mechanisms for treating and preventing disease. Dr. Van Kleeck was more a pharmacist than an active clinician. Countering Dr. Van Kleeck’s work as a physician was the work of Caleb Child, a religiously schooled Deacon and metaphysician who through the assistance of Gilbert Livingston was granted a license to practice medicine, not necessarily a medical degree, some time around 1798. Somewhere between Van Kleeck’s physical medicine beliefs and traditions and Child’s metaphysical medical traditions were the beliefs promoted by Shadrach Ricketson, a Quaker physician with his foot, and mind, placed in every possible doorway that existed into becoming a practitioners of the field of medicine. Ricketson’s first medical experiences involved his personal testing of the influences of Opium on the mind and the possible impact these influences had on the body’s healing mechanisms and vital spark. Aside from promoting the growth of Turkish Opium plants in the United States during the mid-years of his professional life, he came to an understanding of vitalism through the works of the promoters of cow pox vaccine, as a means to prevent small pox. Shadrach brought the vaccination program into the heart of the county, and as a member of the medical society, was in charge of the surgical, obstetrical and some diagnostic tools newly available to the profession. Residing in Troy, he promoted the new medical school nearby. Residing in Poughkeepsie, his services focused on clinical needs and his studies of epidemiology and mechanisms of disease development and spread. Residing in New York City, he shared some of his skills and knowledge with the New York School, published his book on living a healthy lifestyle and maintaining a healthy body, only to be treated with less honor and respect he required from the local medical society officials and Rutgers (then in NYC) teachers. 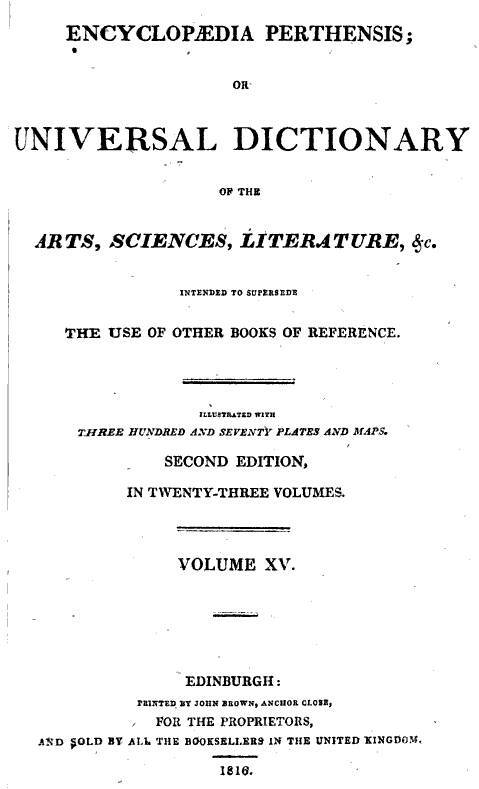 During the earliest years of the publication of the Medical Repository distributed out of New York City. The initial state licensure law allowed only the MDs in New York City to approve someone who completed his apprenticeship and attended the required lectures and anatomy theatre events, visited the lying-in and hospital wards, and engaged in other training sessions was capable of being approved. This sole assignment of licensure related powers tot the lower New York medical society, which referred to itself as a representative of the state medical groups, did not sit well with Albany physicians. The Albany physicians contested the New York Society’s power and prowess in expressing its belief in medical physics and science more so than any claims, philosophies or beliefs related to the metaphysics of life and health. Rightfully, Albany physicians expressed their lack of respect for the New York doctors numerous times, and tried incessantly to define their own belief systems regarding medicine, physiology, the “vital spark”, health, and life. In the decades to come, heat would be the internal energy responsible for the vital spark, at least according to regular doctors like Dr. Van Kleeck. Body temperature was very much linked to natural temperatures, with the addition of some unique aspect of life that makes the body produce its own heat. As an energy type or source, heat behaves very different from electricity and requires very different methods of measurement. 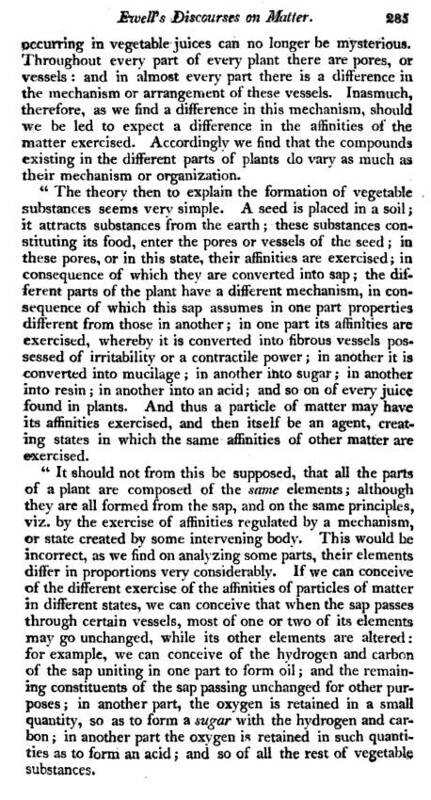 Both of these elements of nature were typical of nature, and the human body. 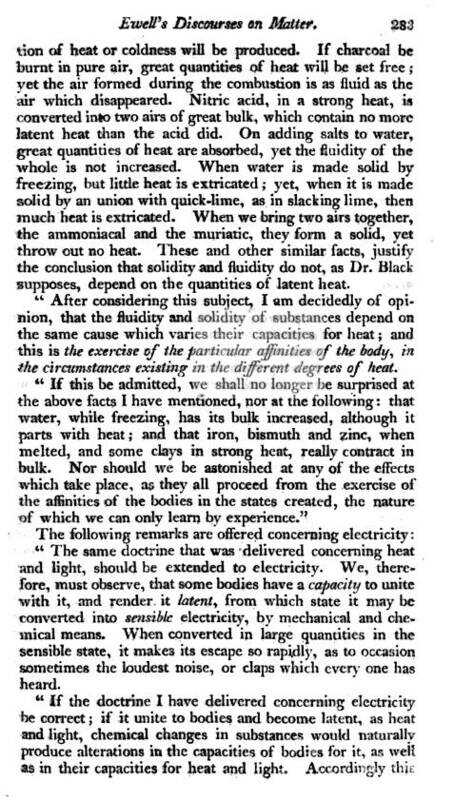 Dr. Joseph Black would make more sense of heat as an energy source by linking it to the production of carbon dioxide–the anti-phlogiston countering the force of life itself in a chemical sense phlogiston (later related to Oxygen). 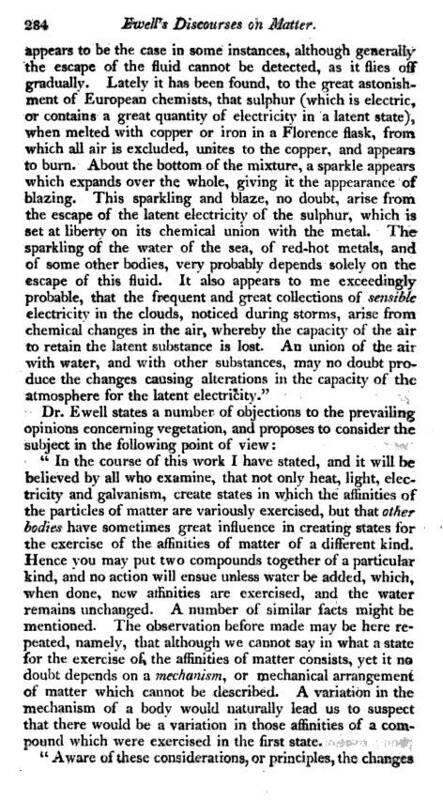 [See http://en.wikipedia.org/wiki/Joseph_Black%5D This carbon dioxide, known by some scholars as ‘fixed air’, was linked to limestone chemical experiments ( thus the link between topography, geology and the formation of miasma and disease), and the respiratory process. 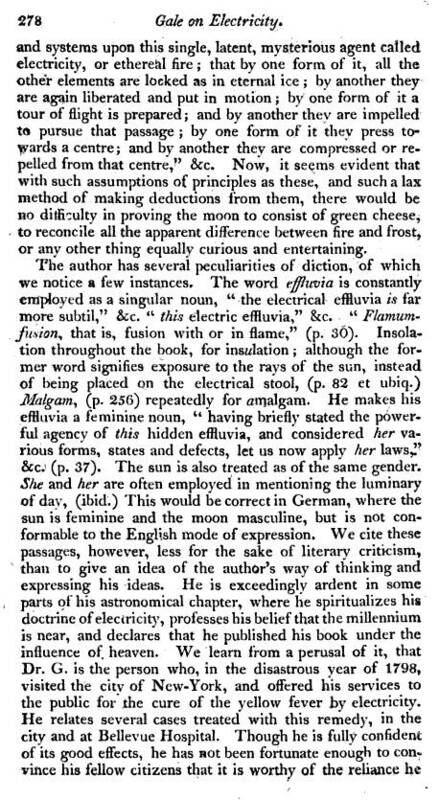 The author(s) of these reviews is/are very critical of both authors, claiming both to be in error with their own–the medical society’s– interpretation of electricity and the chemistry of life. The following two book reviews are published in Medical Repository, vol 4. These cover the work of physician Thomas Gale from Troy, NY; his book on Medical Electricity entitled Electricity, or Ethereal Fire was published in 1802. 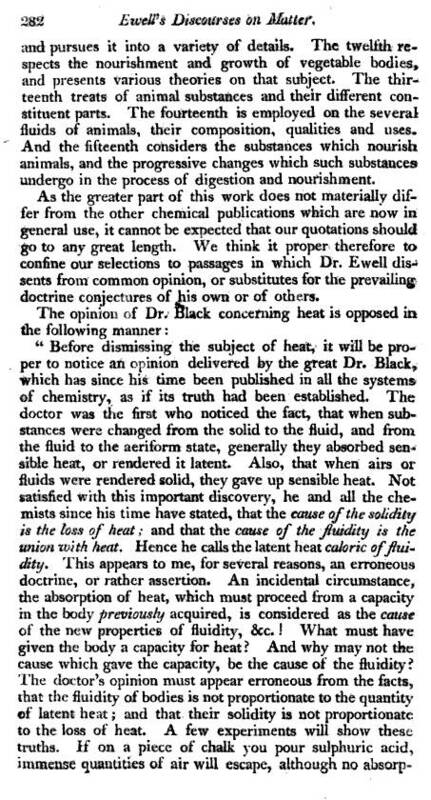 Following this very critical review is a slightly less critical review of the countering philosophy posed in Virginia’s own Dr. Thomas Ewell, whose writings on biology, physiology, the different forms of life and health support the belief that “heat” could in fact be the vital spark to life. 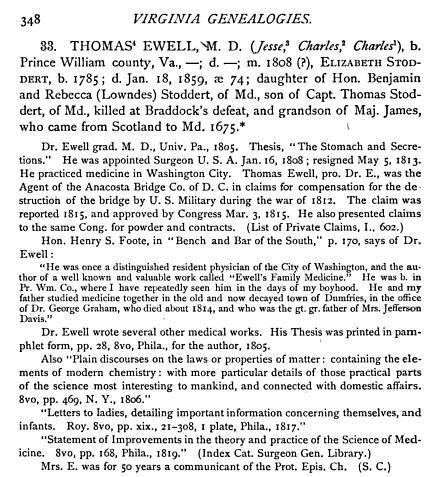 Based on the genealogical note (see genealogical note at the end), it is possible that politics and professional jealousies between the two competitive schools (New York, Medical Repository‘s source, and Philadelphia) may have intervened in Ewell’s book review; Ewell attended the Philadelphia school. This controversy symbolizes a number of important features of United States medicine in 1800. A major conflict erupted in medicine pertaining to independent practitioners’ beliefs in the physical world versus the metaphysical world. This same controversy has existed since the dawn of medicine, but in terms of American or United States history, its rejuvenation is exemplified by its re-emergence following the post-Revolutionary War depression. During this period in American medicine history, a legal system was established for defining and approving doctors. 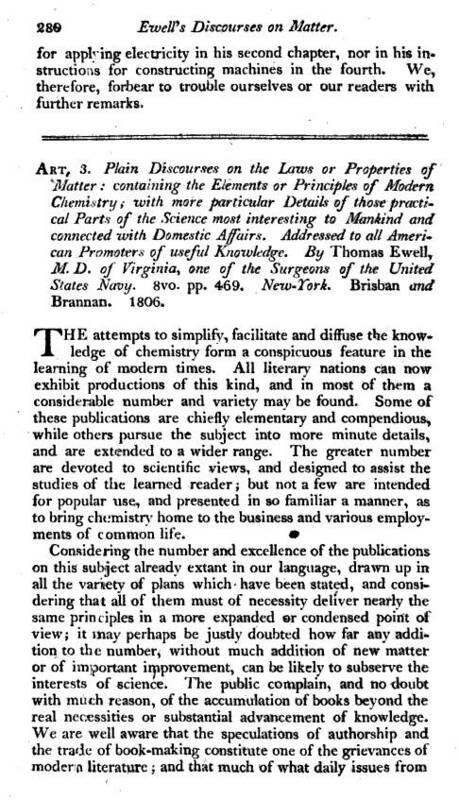 The first attempt was made in 1797, but a more successful attempt to control licensures was finalized in 1806. This pause in legalizing medicine and those considered ‘MDs’ enabled society to develop its own definition of medicine and the medical doctor. As a result, a number of splits developed in some of the most basic parts of what it was the qualified someone for the practice of medicine. First, there was the argument that physicians from the city of New York should not be the only professionals capable of testing and licensing MD’s. Local counties and medical societies argued that they served the rights for approving their own members of the profession. This was accomplished by the rewrite of this state law in 1806. Second, there were significant philosophical differences between the physicians in upper New York, outside the metropolitan limits so far as a day’s trip on horseback was concerned, and the inner New York City physicians themselves, who many felt were mostly the products of European teachers and practitioners and European medical schools, physicians who were not always well informed of the United State medical experience. At times, the philosophies of urban versus rural doctors were so different that conflicts occurred, and letters written and published about these differences. Local counties were at times poorly represented in the “State” meetings sponsored and held by the State Medical Society operating out of New York City. These political and very personal philosophical differences are very well demonstrated by these two book reviews. The Medical Repository editors were already arguing that European doctors were not adequately trained in the practice of United States medicine. 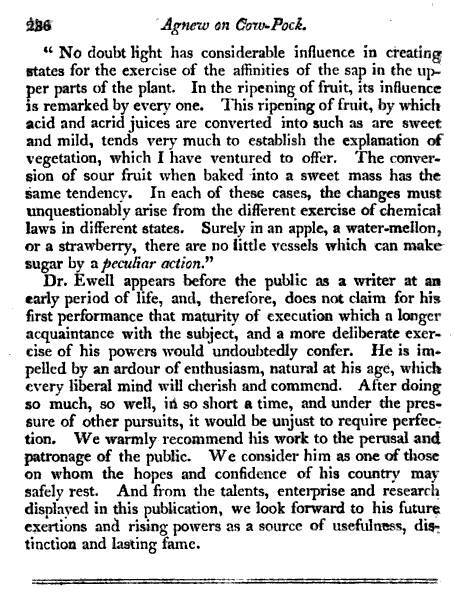 Samuel Mitchell had the most to gain from this argument. 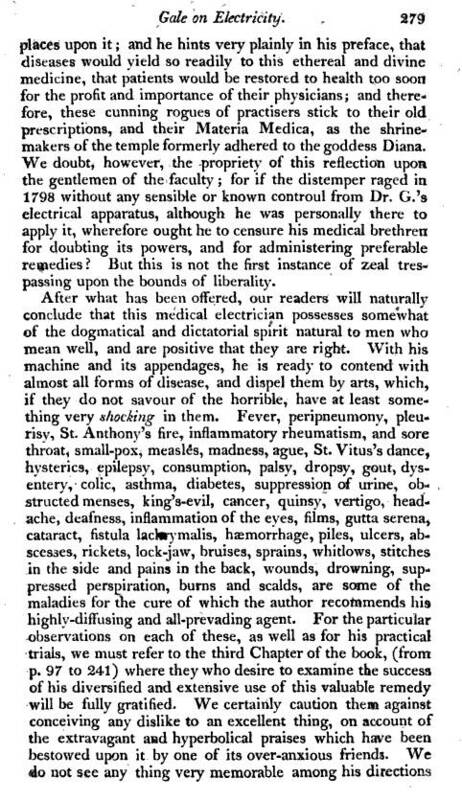 The chief competitor of these physicians locally were the very pro-Anglican practitioners in Philadelphia, with their journal and society led by the famous Benjamin Rush. This political battle between two very intelligent physicians and representatives at the government level would go on for year and continue even after the deaths of their original leaders. For this reason, these two book reviews exemplify the beginnings of of a long-lived social and political battle in American medicine–the regular doctors versus practitioners of the alternative medical fields. These differences in philosophy in metaphysics are typical of much of the arguments noted for today’s “regular” or allopathic and “irregular” or “alternative” medical fields. Endnote: The “Dr. 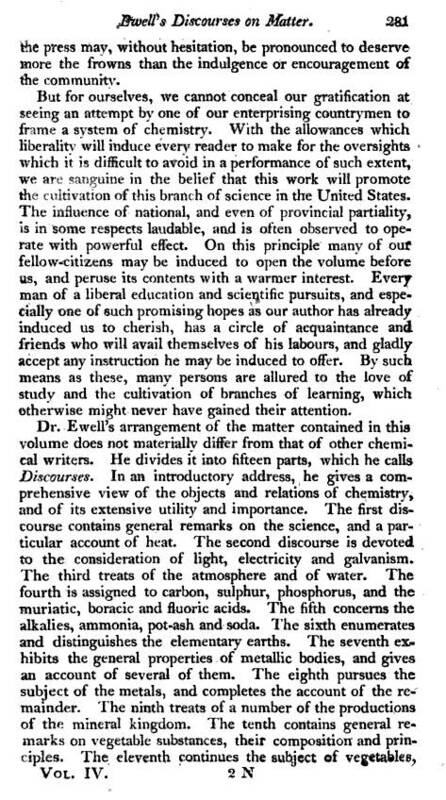 Young” referred to in Gale’s book review is Dr. Thomas Young (see http://en.wikipedia.org/wiki/Thomas_Young_(scientist)).